Częstość występowania u dzieci całościowych zaburzeń rozwoju, takich jak autyzm oraz zaburzeń emocji i zachowania ciągle wzrasta (1). Podopieczni dotknięci wyżej wymienionymi problemami zazwyczaj prezentują w środowisku szkolnym więcej zachowań trudnych niż ich typowo rozwijający się rówieśnicy. Prawodawstwo w USA (2) wymaga, aby u uczniów przejawiających niepoprawne zachowania, które utrudniają naukę im i innym dzieciom, dokonać funkcjonalnej oceny przyczyn ich powstania (ang. functional behavioral assessment – FBA). Odziaływania terapeutyczne powinny być oparte o wyniki oceny funkcjonalnej. Jedną z metod przeprowadzenia oceny funkcjonalnej jest analiza funkcjonalna, czyli eksperymentalna manipulacja czynnikami środowiskowymi w celu określenia ich wpływu na zachowanie trudne (3). U niektórych dzieci, analiza funkcjonalna nie przynosi jednak jasnych wyników. Obecne badanie dotyczy dwójki takich właśnie dzieci. Zostało ono przeprowadzone, aby ocenić zmodyfikowany warunek analizy funkcjonalnej (badający ucieczkę jako potencjalne wzmocnienie) pod kątem efektu utrzymywania stałej uwagi podczas sesji ucieczki. Badanie poszerza metodologię analizy funkcjonalnej w celu opracowywania interwencji dla dzieci, u których wyniki oceny funkcjonalnej nie wskazują jednoznacznie na funkcję zachowania trudnego. Omówiono walory i słabe strony przeprowadzonego badania, a także implikacje mediacyjnych efektów operacji ustanawiających na wynik analizy funkcjonalnej. Wyciągnięto wnioski, iż badania dotyczące procesu analizy funkcjonalnej powinny być dalej prowadzone. The prevalence of students with developmental disabilities such as autism and those at risk for emotional and behavior disorders are steadily increasing (1). These students are more likely than their counter-parts to display challenging behaviors at school. Based on the Individuals with Disabilities Act (2), students that display behaviors that interfere with their learning and that of their classmates require a functional behavioral assessment (FBA) in order to develop an intervention plan based on function. In some instances, the FBA process includes a functional analysis (FA), or the systematic manipulation of environmental variables to determine the effect on behavior (3). For some children, this process does not produce a clear pattern of responding. This study is based on two such children and was developed to assess a modification of the escape condition in a traditional functional analysis (3) to determine the effects of holding attention constant in the escape condition. The present study expands on FA technology in order to be more effective at developing function-based intervention for children whose functional behavioral assessments suggest that their behavior is maintained by multiple functions. Strengths and limitations are discussed, along with implications of the mediating effects of establishing operations on the results of a functional analysis. The need for future research in the use of the FA process is discussed. Słowa kluczowe: analiza funkcjonalna, operacje ustanawiające (ang. establishing operations – EOs), zmodyfikowany warunek sesji ucieczki. Key words: Functional Analysis, EOs, modified escape condition. Autism spectrum disorders (ASDs) are present at birth or appear early in development and interfere with multiple areas of a person’s life (4). The Center for Disease Control’s (5) Autism and Developmental Disabilities Monitoring Network (ADDM) surveillance studies indicate autism suggests that autism affects 1 in 88 children across all racial, ethnic and socioeconomic groups. While there remains speculation around factors that may be contributing to this increase, children and adolescents with ASD frequently experience challenges in academic learning and often display behaviors that can restrict access to a general education placement. When a child exhibits significant behavior challenges the development of a behavior intervention plan based on a functional behavioral assessment (FBA), is warranted. In some instances, an FBA may include a functional analysis (FA) to systematically test the hypothesized function of problem behaviors (3). The majority of these analyses include attention, escape, and automatic reinforcement conditions, as well as a comparison or control (6). Because these can sometimes result in undifferentiated outcomes researchers have begun to examine other variables that could potentially function as confounding variables in a traditional FA, such as demand characteristics (7), therapist attention (8), enriched environments (9, 10), assessment of changing function within conditions (11), and escape-to-attention (12, 13). It is apparent that traditional FA conditions require modifications to address those individuals whose behavior is multiply controlled. This multiple control could perhaps present differently for individuals depending on many variables such as establishing operations (EO), states of deprivation or satiation for particular tangible or social stimuli, or whether the individual escapes to a reinforcing condition contributing to those analyses in which the results are ambiguous, or undifferentiated. For example, Roane, Lerman, Kelley, & Van Camp (14) addressed this ambiguity in a study in which they conducted a minute-by-minute analysis of within session changes in responding that they hypothesize was related to EO’s. An EO is an event that alters the effectiveness of reinforcing consequences as well as the likelihood the previously reinforced behaviors will occur (15). Roane, et al. hypothesized that the presence or absence of an EO could affect the occurrences of behavior within FA conditions. They state, „As a result, levels of responding should be higher in the absence of attention or tangible items than in the presence of these items” (pg. 76). Thus, in analyzing undifferentiated responding in traditional FA conditions, potential confounding variables should be controlled for within conditions in order to assess the true function of the behavior. In the present analysis, we hypothesized that the removal of attention, which consistently co-occurs with the removal of demands during the escape condition, could potentially function as an EO for aberrant behaviors maintained by attention for children with undifferentiated traditional FA’s. If this were the case, then removing the task, but not attention would result in lower levels of problem behavior during the escape condition, assisting with the development of more targeted, function-based interventions. Two school-age boys referred for problem behaviors in the classroom participated. Both students were enrolled in public schools in a Midwestern school district. Jon was served in a regular school setting; Erik was served in an alternative school which offered educational services to students in kindergarten through the 12th grade who engage in severe problem behaviors. Both boys had cognitive functioning and language in the normal range and were on grade-level for academic activities. Teacher and parent consents were obtained for participation in the FA conditions and treatment recommendations were incorporated into the individualized education plans (IEP). Jon was a six-year old Caucasian male with ASD in a general education first-grade classroom with a dedicated paraprofessional (para). Jon displayed elevated rates of inappropriate verbalizations (“I can’t do this”, “I’ll gut you with my light saber!”), physical aggression towards both adults and peers (hitting, kicking, stabbing with pencils), and had a history of behavior problems across settings and adults since preschool. Erik was a six-year-old kindergarten male diagnosed with attention deficit hyperactivity disorder, reactive attachment disorder, sensory integration dysfunction. Erik was nominated by his special education teacher, for verbal (making threatening comments such as “I am going to hurt you” or “I am going to kill you”) and physical (hitting and kicking) aggression, and other “disruptive” behaviors (throwing books, pencils, and papers). Jon’s sessions were conducted in an unoccupied classroom next to the special education room where the child occasionally received pull-out services. The child was brought to the empty classroom from his general education classroom by his dedicated paraprofessional (para) for the FA procedures. Erik’s assessment was conducted in the Special Education classroom. Materials included a functional analysis training package (16) to train the para. For Jon, worksheets requiring written responses on grade-level math problems were used during test conditions and toy dinosaurs with a plastic volcano during the play condition. For Erik, four color coded cards (one for each functional analysis condition) were added to be used by the para as visual cues for how to perform each condition. Other materials used during FA sessions for Erik were grade-level reading and writing worksheets during test conditions and a dominoes game during the play condition. Each condition was timed using a digital timer. For both students, a standard assessment protocol was conducted in which school personnel and parents were interviewed. The instrument and procedure followed the FBA model described by O’Neill, et al. (17). Based on the results of this assessment, it seemed that Jon engaged in various forms of problematic behaviors (e.g. non-compliance, verbal aggression, physical aggression towards peers, physical aggression towards adults, etc.) for a variety of “reasons” – that is, a discrete function was unclear. Based on the reported frequency and severity of occurrences, two of the elevated problem behaviors were targeted for the purposes of the FA: verbal (e.g. “I’ll hurt you”) and physical (hitting, kicking, stabbing) aggression. For Erik, the interview was conducted with the special education teacher with direct observations by the researcher during descriptive assessment sessions. Because the outcome of the interview was mixed and the problem behaviors placed him and others in danger (occurring 2-3 times per hour), the team decided to proceed with an FA. FA training consisted of three units which explained the procedures for escape, attention, and play conditions. This training package was based on procedures outlined by Iwata, et al. (3) and had demonstrated effectiveness at quickly teaching untrained adults how to implement each condition in a prior study (16). Paras were required to reach 100% level for answers to the study guide quizzes. Training took approximately 30 minutes, was conducted immediately prior to the session, and was accompanied by the instruction, “*If at any time, the child becomes hurt or is in danger of being hurt, end the session.” Subsequent to implementing the three traditional conditions with Jon, the training package was modified to include a modified escape condition. The second author provided the training and coaching to each para. The FA (3) was performed by the para and consisted of three conditions lasting 5 min with a 5 min break between conditions to reduce carryover effect. FA conditions were presented in random order. A continuous reinforcement schedule was used during the FA for each of the behaviors identified in the descriptive analysis. During the attention condition, each occurrence of a target behavior resulted in a brief and immediate form of attention (e.g., eye contact and a brief statement to the child such as “work on your assignment”). During the escape condition, each occurrence of a target behavior resulted in removal of materials and no verbal attention or eye-contact (the para removed the materials and turned away from the child) with a 30s break from demands. After a 30s break, demands resumed with the presentation of the task. During the play condition, (the control) no demands were placed on the student, continuous access to leisure items was available, attention was delivered at least one time every 30s, and target behaviors were ignored. For Jon, one of the escape conditions was terminated 15s early based on a display of aggression where he attempted to stab the para with a pencil. Between traditional FA sessions for Jon, the authors reviewed the data and determined the function remained unclear. A modified escape condition was developed to clarify the undifferentiated results. During this condition, the occurrence of a target behavior resulted in removal of materials, no verbal attention for the problem behavior (i.e., did not redirect or otherwise verbally acknowledge the occurrence of the problem behavior), and attention was maintained in the form of comments and/or questions (e.g. “Did you sleep well last night?” “You’re wearing a red shirt today”), and a 30s break from demands. After a 30s break with continuous attention, demands resumed. The escape and play conditions were identical to those presented in the traditional FA analysis. The modified escape condition was also introduced for Erik when the results of the traditional FA remained undifferentiated. The second author collected data using a cassette player with headphones, and a pre-recorded tape announcing the end and beginning of each 20s interval for both children. IOA was collected in 15% of sessions for Erik. IOA was calculated by taking the total number of agreements and dividing by the total number of agreements plus disagreements. IOA for the descriptive assessment ranged from 93% to 100% and from 91% to 100% for problem behaviors across FA conditions. No IOA was collected during Jon’s sessions. Traditional Functional Analysis. For Jon, verbal aggression occurred in 17-87% of observed intervals for attention and 23-53% of escape as compared to the play condition (0%) (fig. 1). Physical aggression occurred in 0-20% of intervals during the escape condition and 0-7% of intervals during the attention condition, as compared to 0% for play (fig. 2). For Erik, target behaviors occurred in 38-72% of observed intervals during the preliminary assessment process, 42-92% during the attention and 5-72% of traditional escape conditions as compared to play (0-2%) (fig. 3). Fig. 1. Verbal Aggression During Traditional FA and Modified Escape Conditions. Fig. 2. Physical Aggression During Traditional FA and Modified Escape Conditions. Fig. 3. Aberrant Behaviors During Traditional FA and Modified Escape Conditions. Modified Functional Analysis. For Jon, figure 1 shows verbal aggression occurring in only 3-14% of intervals; figure 2 shows physical aggression at 0%. As can be seen in figure 3, for Erik target behaviors only occurred in 5-25% of observed intervals. For both boys, an intervention plan for attention was developed and included antecedent strategies such as staff training in ways to provide attention to contingent upon the occurrence of appropriate behavior with a 4:1 ratio for positive to corrective statements, and teaching appropriate replacement behaviors to gain attention (e.g. “Can you help me with this?”). This plan also included consequential control procedures including attention extinction, non-verbal task cueing (e.g. tapping the paper), and ways to provide minimal attention in the form of a description of the available reinforcement contingency (e.g., “I’ll talk to you when you are done with this problem”). For Erik, the plan also included strategies to address escape behaviors. Figure 4 shows the frequency of target behaviors occurring at school each month and at 1 year follow-up for Jon. 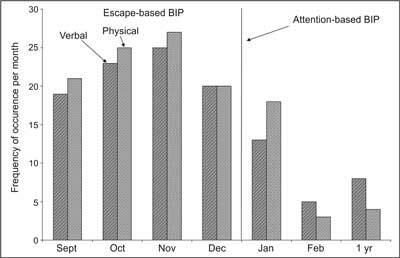 Data range from 19-25 instances for verbal aggression and 20-27 for physical aggression per month during the escape-based behavior intervention plan. Following the implementation of attention-maintained strategies, data show a decreasing trend with verbal aggression decreasing to 13 instances in the month following implementation and further decreasing to 5 instances the following month. There was an immediate decrease in physical aggression to 18 instances, with a substantial decrease to 3 occurrences in the following month. Gains are maintained at 1-year follow-up with verbal aggression only occurring 8 times and physical aggression 4 times for the entire year. Fig. 4. Frequency of Verbal and Physical Aggression at School. The present study explored the possibility that the programmed consequences of removal of both the task and adult attention in the escape condition of a traditional FA may create an establishing operation (EO) for attention. This may lead to an increase in target behaviors in the escape condition, despite the legitimate function of the behavior being attention. If modifying the escape condition (holding attention constant) results in low levels of problem behavior (in which attention is not withdrawn as compared to that of the traditional escape condition in which attention is withdrawn), this would suggest that escape from task was not a maintaining variable and perhaps the removal of attention during the traditional escape can result in an EO for behaviors that had historically resulted in adult attention. The results of this study support this suggestion that, for some children, the removal of attention in the traditional escape condition could function as a moderating variable on the outcomes of an FA. As with any exploratory study, several weaknesses are apparent. First, the small number of participants precludes any definitive conclusions. In addition, the number of data points collected during each condition were limited. Another area of concern is the overlapping data points shown between the two escape conditions for Erik further reducing the ability to allow any definitive conclusions to be drawn. Finally, given the exploratory nature of the analysis with Jon there was no inter-observer reliability or treatment fidelity data to report. For Erik, the duration of the study was short as it was conducted close to the end of the school year, also resulting in limited and unequal assessment sessions. Finally, intervention recommendations addressing both attention and escape function were recommended confounding any effect on behavior. No data were collected on the effects of the intervention. This line of research is in its initial development phase – many more studies need to be conducted to determine if the modification of traditional FA conditions leads to more effective interventions. Refinement of the procedures and analysis of FA and intervention results need to be conducted before it will become clear whether a modification of existing FA technology would produce a significant contribution to the literature. It is our hope that this line of research will continue in order to advance the science by providing assessment options for the applied setting, based on information resulting from the experimental functional analysis, rather than the descriptive analysis, of this escape-to-attention pattern of behavior. Recently, researchers have begun to examine assessment procedures for behaviors that have multiple maintaining contingencies. For example, LaBelle and Charlop-Christy (11) examined a procedure to assess behaviors that have multiple and within-session changing functions. Still more research is needed to develop precise methods for determining the function of problematic and challenging behaviors. Behavior can have multiple maintaining variables and traditional FA conditions can confound escape from task with extinction from attention. If we are to be able to differentiate between attention-maintained behavior and escape-maintained behavior, we must be able to develop a condition that is distinctly different. The refinement of FA conditions can allow for a more targeted function-based intervention. While the results of these two case studies using a modified escape condition are promising, future research should be conducted to determine the necessary and appropriate procedures required for use with those individuals whose patterns of responding are unclear. 2. Individuals with Disabilities Education Act Amendments of 2004, 11 Stat. 37 U.S.C. Section 1401. 3. Iwata BA, Pace GM, Dorsey MF et al. : The functions of self-injurious behavior: An experimental-epidemiological analysis. Journal of Applied Behavior Analysis 1994; 27: 215-40. 4. American Psychiatric Association. Diagnostic Statistic Manual IV-TR. Washington, DC, 2000. 5. Centers for Disease Control and Prevention – Department of Health and Human Services (March 30, 2012). Prevalence of Autism Spectrum Disorders – Autism and Developmental Disabilities Monitoring Network, 14 Sites, United States. Morbidity and Mortality Weekly Report 2008; 61: 1-24. 6. Hanley GP, Iwata BA, McCord BE: Functional analysis of problem behavior: A review. Journal of Applied Behavior Analysis 2003; 36: 147-185. 7. Dunlap G, Kern-Dunlap L, Clarke S, Robbins FR: Functional assessment, curricular revision, and severe behavior problems. Journal of Applied Behavior Analysis 1991; Special Issue: Social validity: Multiple perspectives 24(2): 387-397. 8. Moore JW, Mueller MM, Dubard M et al. : The influence of therapist attention on self-injury during a tangible condition. Journal of Applied Behavior Analysis 2002; 35: 283-286. 9. Vollmer TR, Marcus BA, LeBlanc L: Treatment of self-injury and hand mouthing following inconclusive functional analyses. Journal of Applied Behavior Analysis 1994; 27: 331-344. 10. Golonka Z, Wacker D, Berg W et al. : Effects of escape to alone versus escape to enriched environments on adaptive and aberrant behavior. Journal of Applied Behavior Analysis 2000; 33: 243-246. 11. LaBelle CA, Charlop-Christy MH: Individualizing functional analysis to assess multiple and changing functions of severe behavior problems in children with autism. Journal of Positive Behavior Interventions 2008; 4: 231-241. 12. Mueller MM, Sterling-Turner HE, Moore JW: Towards Developing a Classroom-Based Functional Analysis Condition to Assess Escape-to-Attention as a Variable Maintaining Problem Behavior. School Psychology Review 2005; 34: 425-431. 13. Sarno JM, Sterling HE, Mueller MM et al. : Escape-to-attention as a potential variable for maintaining problem behavior in the school setting. School Psychology Review 2011; 40: 57-71. 14. Roane HS, Lerman DC, Kelley ME, Van Camp CM: Within-session patterns of responding during functional analyses: The role of establishing operations in clarifying behavioral function. Research in Developmental Disabilities 1999; 20: 73-89. 15. Michael J: Distinguishing between discriminative and motivating functions of stimuli. Journal of the Experimental Analysis of Behavior 1982; 37: 149-155. 16. Bessette KK, Wills HP: An example of a para-implemented functional analysis and intervention on behavior problems demonstrated by an elementary student with severe behavior problems. Behavioral Disorders 2007; 32: 192-210. 17. O’Neill RE, Horner RH, Albin RW, Sprague JR, Storey K, Newton JS: Functional assessment and program development for problem behavior: A practical handbook (2nd ed.). Pacific Grove, CA: Brooks/Cole 1997.